Impressive Atlanta rockers Royal Thunder have proven their credentials in the modern rock scene on the back of a couple of solid EP’s and great albums. Debut LP CVI blindsided me with its explosive rock hooks, dynamic songwriting, and bluesy southern swagger, flooring me in such a way that I admit to being apprehensive when they returned with sophomore album Crooked Doors in 2015. However, time has boosted my already strong feelings about the more measured, mature, and emotionally-charged Crooked Doors, an album conceived in turbulent circumstances after a relationship breakdown between two of the band’s prominent members. Frontwoman Miny Parsonz and co. channeled their hardship into a splendidly multi-faceted break-up album, recalling Fleetwood Mac’s timeless Rumours album. Wick represents the crucial next chapter in the band’s career, exorcising more personal demons and bearing the raw nerves and scars of heartache, tinged with a hint of optimism. Shedding most of the metallic and sludgy elements that marked their early work, Royal Thunder expand their sound into more dynamic and hazy rock waters. Cherry picking rock elements from multiple decades, including ’60s and ’70s classic rock, nods to a hard to pinpoint ’80s influence, and ’90s alt-rock cues, Royal Thunder bundle their varied influences with clever pop hooks, shady psychedelia, and fiery modern rock sensibilities. In many ways sounding like the logical successor to Crooked Doors, Wick is a moody, emotional and musically diverse affair, continuing the impressive evolution of Royal Thunder’s gritty hard rock. Opener “Burning Tree” is indicative of a handful of slow burning songs on the album, with its elusive hooks proving rewarding on multiple listens. Whether they make their impact immediately or after several detailed spins, the choruses and addictive melodies on Wick bore into your brain and lodge there like stubborn ticks, making a strong case for replay value. Wick’s measured pace doesn’t indicate a softening of the band’s emotive hard rock, rather a detailed refinement and coloring of their rock palette, resulting in songwriting rich in diversity and dynamically executed. “April Showers” boasts a simmering tension, haunting melodies and a loose, expressive groove that sounds like a more compact spiritual cousin of the sublime “Time Machine” from Crooked Doors, setting a strong standard early on. The bright verses of “We Slipped” play-up the band’s poppier tendencies before changing gears into a raucously punchy chorus, eventually winding down with a gentle and beautifully adorned climax. Musical variety is Wick’s strong point, which would mean little if the compositions were a mess. 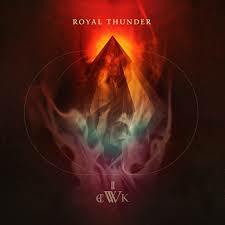 Thankfully the writing remains consistently strong and while arguably the least rocking album of Royal Thunder’s career thus far, Wick still has plenty of guts and emotional impact. When they do choose to unleash the hard rocking beast, songs like “The Sinking Chair” and “Turnaround” deliver in spades, the former in particular is an absolute spitfire, its seething tone reminiscent of “The Line.” The sparse and bluesy waltz of “Plans” is injected with a gutsy vocal performance, sounding like an ideal song for a darkened dive bar soundtrack, and I mean that in the best possible way. “Push” offers another brooding example of Royal Thunder’s masterful rock dynamics and heart twisting emotion. It’s a lush and hypnotic song that pulls on the heartstrings, showcasing Parsonz’s more delicate vocal range. I would like to hear Parsonz explore her wider range more often, as her restrained and melodic singing voice is a joy to behold. Overall, only a couple of songs dip below the album’s high standards but are solid nonetheless. It remains hard to look past Parsonz as the band’s focal point, as she steals the show regularly, standing out as an excellent rock vocalist and solid bassist to boot, sporting a deceptive range beyond her trademark rough-edged singing style. However, the rest of the band are no slouches, creating a tight and imaginative platform. The textured and finely detailed playing of guitarists Josh Weaver and Will Fiore features their own distinctive flair to compliment broad rock influences, peppered with progressive and psychedelic touches. The production fits the music well, sounding modern and organic while allowing the instrumental subtleties to shine through and wisely emphasizing the stunning vocal work of Parsonz. Crooked Doors may have been a difficult act to follow, but Royal Thunder acquit themselves admirably on Wick, crafting a terrific rock album that stands toe-to-toe with their previous work. Wick confidently maintains the high-quality songwriting and consistency that has marked Royal Thunder’s career so far, resulting in a colorful and adventurous album that lives up to lofty expectations.